Informational page about the "Autologous Matrix Induced Chondrogenesis" surgical technique, used for the treatment of knee cartilage defects. Autologous Matrix-Induced Chondrogenesis (AMIC) is a surgical method used for the treatment of small to medium sized localized, knee cartilage defects. The operation is essentially a variation of the classic microfracture technique, which has been used for more than 20 years. AMIC combines elements from another, more advanced technique called autologous chondrocyte implantation (ACI). First, let's start with the basics and explain what the microfracture operation is. 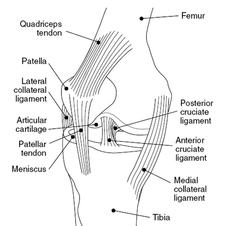 Microfracture is the oldest and best studied surgical technique used for cartilage regeneration. Microfracture is used throughout the world, thousands of times per year and is also the cheapest method for treating cartilage defects. What happens during a microfracture ? Microfracture is a minimally invasive operation carried out via arthroscopy. After the patient has been sedated, the surgeon makes two very small incisions, called key-holes, through which he inserts a tube-like camera and his medical instruments. He then clears any calcified cartilage in the lession and drills several small holes, called fractures, in the damaged area. Immediately, blood starts to form from these holes, all instruments are removed, the keyholes are stitched and the operated extremity is bandaged. As said before, blood starts to flow from the drilled holes. This blood contains numerous ingredients like growth factors, mesenchymal stem cells and progenitors cells. These ingredients then start to form a clot. The clot then gradually begins to mature and over time turns into new cartilage. Unfortunately, microfracture is not a perfect technique and has many limitations. The first limitation is that the cartilage created from this technique does not have the same properties as our natural cartilage does (called hyaline cartilage). This cartilage, called fibrocartilage, is less robust and in many patients wears off after a few years. As a result, the patient needs to have additional future operations..
Another limitation of microfracture is that it is only succesfull when treating small cartilage defects. By small, we refer to defects with a maximum size of 2.5 cm2. Generally speaking, the larger the cartilage lession, the smaller the chances of success. It is very expensive, with an average cost of about 30,000 $ in the U.S. These disadvantages led to the development of AMIC. What makes AMIC different ? An AMIC procedure begins as any other typical microfracture operation. The calcified cartilage is cleared and the fractures are drilled. But then the surgeon uses a special membrane to patch the drilled area. This membrane helps the flowing blood to stay in place and further protects the super clot. AMIC mainly has one disadvantage. Placing the aforementioned membrane is difficult and since the operation is still new few surgeons have the experience to do it arthroscopically. As a result, a mini arthrotomy has to be performed which means a more painfull rehabilitation. What do the studies say ? AMIC is very new and as a result very few long-term studies are published. Still, the few that are published and the available anecdotal evidence clearly indicate that AMIC yields way better results than microfracture alone does. APOS therapy saved my life. I was on a fast downhill spin into disability, seeing only surgery on the horizon and then these shoes came along and got me back on my feet. Chronic pain can be extremely hard to explain to loved ones, but The Spoon Theory is an easy to understand breakdown.